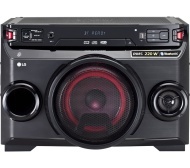 alaTest has collected and analyzed 13 reviews of LG LOUDR OM4560 Wireless Megasound Hi-Fi System - Black. The average rating for this product is 4.7/5, compared to an average rating of 4.1/5 for other Audio Systems for all reviews. We analyzed user and expert ratings, product age and more factors. Compared to other Audio Systems the LG LOUDR OM4560 Wireless Megasound Hi-Fi System - Black is awarded an overall alaScore™ of 89/100 = Very good quality. Compact, Loud enough for a good party, Versatile. This product is very good for the purpose I bought it for and I can promise my friends are going for it.